Wyoming Jade is the most famous of the state’s geologic treasures, and on Jan. 25, it reached its 50th year as Wyoming’s official state gemstone. The state gemstone is nephrite jade, and when found in Wyoming, it’s referred to as “Wyoming Jade” due to its high quality and relative abundance in the state. To mark the 50th anniversary, the WSGS has on display more than 50 specimens of jade at its building on the University of Wyoming campus in Laramie. More information about the exhibit can be found in the news release. WSGS gems and minerals geologist Wayne Sutherland is working on an updated publication covering the geologic occurrence, mineralogy and history of Wyoming Jade. Some of his research thus far can be found on the WSGS’ gemstones webpage. The WSGS used its newly-developed model to determine a preliminary approximation of baseflow levels across the state of Wyoming. The results of the study are reported in Open File Report 2016-8, “Wyoming State Geological Survey Statewide Groundwater Baseflow Study.” The report is available as a free download. The purpose of the project was to develop a straight-forward model capable of making reasonable large-scale estimates of baseflow for Wyoming using precipitation data, other readily available environmental data and Geographic Information Systems (GIS) techniques. Baseflow is a significant component of groundwater recharge and constitutes an important water resource first accessed through groundwater wells and then by surface water users. Read more about the report here. This project will be a detailed study of the sedimentary petrology, related stratigraphy, structural history and hydrologic flow history of the Gas Hills mining district in Fremont and Natrona counties. Geologist Robert Gregory is leading the investigation, which will involve examining regional geology and stratigraphy as well as the processes responsible for the development and mineralization of the uranium deposits. Expected completion date is June 2018. WSGS geologist Robert Gregory will investigate uranium resources in the Gas Hills area in Fremont and Natrona counties. The groundwater atlas will be updated regularly as new information becomes available. The initial release is scheduled for April. WSGS natural resource analyst James Stafford is the principal investigator on the project. Groundwater quality, and subsequently the use(s) for which it is suited, varies widely throughout Wyoming. This is most evident in the large sedimentary structural basins where the majority of the state’s population resides and the greater part of economic activity occurs. An aquifer may produce high-quality groundwater suited for human consumption at a basin’s margin while water pumped from the same aquifer a few miles basinward may be unfit for livestock usage. One measure of water quality is its salinity, which is the amount of dissolved material that remains as residue after the liquid portion of a water sample evaporates. Hydrologist Karl Taboga is evaluating groundwater salinities occurring at depths of 5,000 feet or less below ground surface in the southern Powder River structural basin of northeastern Wyoming. Special emphasis is placed on saline groundwaters that may be suited to industrial uses thereby conserving higher-quality waters for domestic, agricultural and livestock uses. The report is scheduled to be published in 2017. 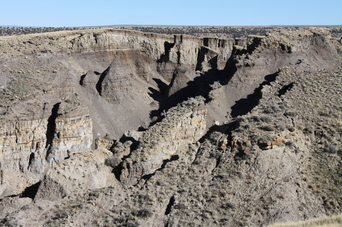 Landslides are geologic hazards that occur every year in Wyoming, mostly in remote areas where they typically do not cause damage or pose risk to people. 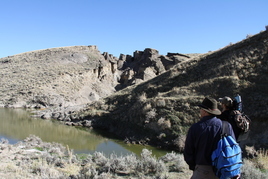 In November, the WSGS joined a Discovery Channel camera crew at the site of the Buffalo Creek Landslide in the Bighorn Basin. Hunters noticed the landslide in 2015, and its dramatic appearance seen in photos posted on social media gained national attention. The landslide is approximately 10½ football fields in length, and it is about 360 Olympic swimming pools worth of material. WSGS geologists are not sure what triggered the landslide, but believe that water may have played a role by acting on the bentonitic shale horizon, creating a lubricated plane of weakness. The video, produced and owned by Discovery Channel, can be viewed on the WSGS’ YouTube channel. The Survey has mapped more than 30,000 landslides in Wyoming and maintains the database of these locations. More information about the Buffalo Creek Landslide and other landslides in Wyoming can be found on the WSGS’ website. The Buffalo Creek Landslide was noticed by hunters in fall 2015. 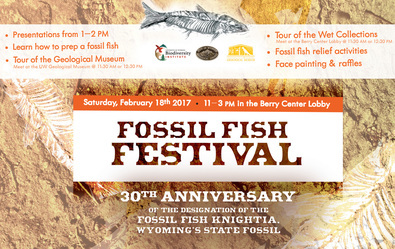 Be sure to mark your calendars for the Feb. 18 Fossil Fish Festival in honor of the 30th anniversary of Wyoming’s state fossil, the extinct fossil fish called the Knightia. The WSGS is teaming up with the University of Wyoming Geological Museum and the Biodiversity Institute to host the event, which will be 11 a.m.-3 p.m. at the Berry Center on the UW campus in Laramie. The family-friendly celebration will include an array of activities. 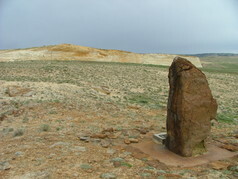 The WSGS will have a table with several fossils on display. Knightia are a common fossil fish of the Eocene Green River Formation and were the first fossils discovered in Wyoming. They are related to modern-day herring and lived 50 million years ago in an ancient lake system in southwestern Wyoming. The Wyoming State Geological Survey (WSGS) will soon release a report concerning groundwater response of Wasatch and Fort Union Sandstones to reduced coalbed natural gas development (CBNG) in the Powder River Basin (PRB). According to the Wyoming Oil and Gas Conservation Commission, from 2001-2014, the PRB produced more than 5.6 trillion cubic feet of CBNG and nearly 954,000 acre feet of groundwater. As a result, groundwater levels were substantially lowered in areas undergoing development. WSGS hydrologist Karl Taboga has assessed groundwater responses to declining CBNG production at 40 U.S. Bureau of Land Management well sites. The results will be published in early 2017 in a Report of Investigations. Whether as an armchair traveler or while planning a road trip, wouldn’t it be nice to know something about the geology of Wyoming? Better yet, wouldn’t it be nice to have a digital platform with information and photos, easy to access and navigate? In an effort to put geologic information about various sites across Wyoming into the hands of visitors, the WSGS is developing a “story map.” The online feature uses ESRI's GIS tools to combine geospatial data with photos and text to create a multifaceted tour of Wyoming. The story map’s initial launch will be from the WSGS website and will spotlight eight locations: Old Faithful, Devils Tower, Fossil Butte, Grand Teton, Hell’s Half Acre, Vedauwoo, Sinks Canyon and Thermopolis Hot Springs. By selecting a location on the map, the user will be able to view photos and information about the specific site. There will also be contact information for museums in the state. The story map’s launch date is scheduled for this spring. It will be available to the public at no charge. A primary incentive for the WSGS to launch an online Oil and Gas Map of Wyoming was having the ability to update the data layers more frequently. After the interactive map's unveiling in July, staff are beginning the first review and update of the oil and gas fields, oil refineries, gas processing plants and federal development areas. Additional functionality will also be added to the online map in the form of new query tools. Read more about the launching of the online oil and gas map here. The 3 WSGS scientists who developed the online map detailed their work in an article featured in the Winter 2017 edition of GIS magazine, ArcNews. Are you planning to see the Total Solar Eclipse as it crosses over the center of Wyoming Aug. 21? Enhance your experience by also checking out the abundance of geologic features in the eclipse's path. Leading up to the eclipse, the WSGS will highlight some of the various locations on its social media pages (Twitter, Facebook and Instagram) as well as on its website. The WSGS was recently featured on an episode of "Wyoming Chronicle" on Wyoming PBS. The segment includes interviews with staff and some of the projects they are working on. View the segment here.